A roadmap to restore devolution to Northern Ireland has been revealed by the British and Irish governments. It contains a target date of 26 March 2007 for a new executive to be up and running. The parties have until 10 November to respond to the plan. If they agree to it, a first and deputy first minister would be nominated on 24 November. 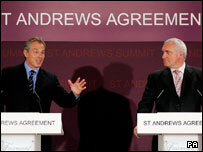 The plan follows three days of multi-party talks at St Andrews in Scotland. Prime Minister Tony Blair said there would have to be some form of electoral endorsement of the plan - either an election or a referendum. He said the two key components of a plan were that all parties accept the police and courts and have a clear agreement on power-sharing. "So those are the two essential parts of it," Mr Blair said. "We've been through different parts of this process many times over the past few years but I think this is a sound basis to proceed." The government's plan also envisages the devolution of policing and justice powers in two years from the creation of the executive. This is long overdue for the people of Ulster. I pray that devolution will finally take hold and that peace and goodwill can be restored between both the Catholic and Protestant communities. Good luck to you all. However, this would be subject to a cross-community vote in the assembly. A financial package is also included in the draft agreement. One of the proposals is a cap on domestic rates under the new capital value system if the governments' plans are accepted by the parties. It also suggests the possibility of further rates relief for pensioners on lower incomes. Speaking after the governments revealed their plan, DUP leader Ian Paisley said Northern Ireland was at a crossroads and republicans had a choice and "delivery to make". "Delivering on the pivotal issue of policing and the rule of law starts now," Mr Paisley said. He said the DUP negotiators had dealt with a number of issues during the talks and that in the delivery of an overall package they "had retained the retention of academic selection" in the province's post-primary sector. Sinn Fein president Gerry Adams said that the plans needed to be consulted on, but restoring the political institutions was an "enormous prize". "Common-sense political realism and the interest of all our people demand we achieve this," he said. Ulster Unionist leader Sir Reg Empey said what had been agreed was the "Belfast Agreement for slow learners". "Sinn Fein will sign up to the PSNI being the only force of law and order and Ian Paisley, or a colleague, will share the joint office of first and deputy first minister with Martin McGuinness in a mandatory coalition," he said. SDLP leader Mark Durkan said welcome progress had been made towards restoring the power sharing institutions and pledged that his party would continue working towards this. "We believe that we can move from the politics of stand-off to lift-off," he said. Alliance Party leader David Ford said the outcome was a mix "of challenges and opportunities". "Despite all that remains to be done, there is now at least a sense of hope for a shared future," he said. The Northern Ireland Assembly was suspended on 14 October 2002 amid allegations of a republican spy ring at Stormont. Direct rule from London was restored in October 2002 and has been in place since.